LG Washer with a CE Error Code: Rotor? Stator? Wassamattor? 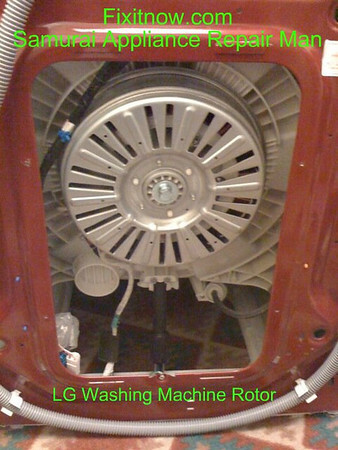 I went out on an LG washer service call yesterday, model WM1814CW. Complaint: flashing the CE error code. This code is generated when the main control board detects a problem with the motor circuit. As the name implies, the rotor rotates (cuz it’s attached to the drum) and the stator stays still. The stator is located underneath and housed within the rotor. See the next pic. The stator creates the magnetic field that pushes on the magnets in the rotor and makes it move. Together, the stator and rotor make the motor that runs this machine. Anyway, with a CE error code, the first place you’re gonna go to lookin’ for trouble is the motor. Now, these stator and rotor designs are pretty doggone simple and rugged, there just ain’t a whole lot that can go wrong with ’em compared to a conventional electric motor with a drive shaft. So I started poking around and discovered that one of the water fill hoses in back had sprung a small leak and had been dribbling down into the stator/rotor assembly. Well, that’s bad news, Grasshoppah, ‘cuz when you get a CE error code, you gotta replace the stator AND the main control board. “Why is that, oh Most Fermented One?” you ax, plaintively. In general on LG washers, when you see a burned out control board, make sure you fix the condition that caused it before you replace it or you’ll be replacing it again… real soon! In this particular case, with a CE error code and compromised stator, you MUST change both the stator and the main control board. If you don’t change both parts you will be sorry! Since the rotor is just basically a bowl of magnets, it’s usually unaffected in these cases unless it’s thoroughly rusted. The replacement boards may look a little different from the original but that’s OK– the manufacturers are always monkeying around with the parts, especially the electronics board, to incorporate changes as they get feedback from us professional appliantologists in the field. As long as you’re looking it up by model number, you’ll get the right one. 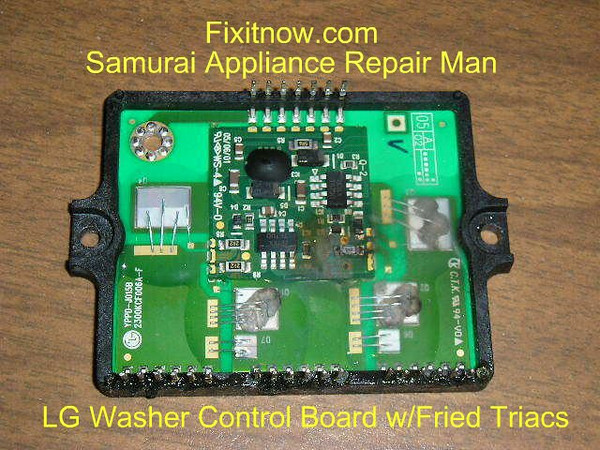 This entry was posted in Washer Repair on September 3, 2010 by Samurai Appliance Repair Man. 1) Not sure if it’s relevant—but the photo of the “LG Washer Board” with burnt triacs is not from the WM1814 washer MAIN BOARD. However–in the parts look-up–the correct image is shown. 2) When ordering MAIN or DISPLAY BOARDS—it’s super-imperative that the SERIAL NUMBER be given to ensure that the *correct* part is ordered. This I know from bitter experience wasting my customer’s time as well as my own trying to repair an LG washer (in or out of warranty). In rare instances for example—a replacement MAIN BOARD may not be not compatible with the original DISPLAY BOARD and may **not** function if used with the original DISPLAY BOARD. On other washers—other options & features were also changed during their production life–ALLERGIENE cycle / LOAD SENSING / SOFTWARE UPDATES (imbalance load detection) / etc. 5) The “CE” error is also very,very rare. 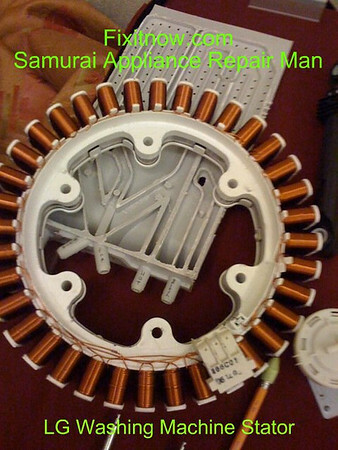 In some older LG washers in which non-HE detergents were used for a number of years (and the newer HALL EFFECT SENSOR was already installed previously) the MAIN BOARD can be damaged but the STATOR / MOTOR is fine. In this instance—simply replacing the MAIN BOARD is usually the only part that was needed. Thousands of loads of laundry over 4 to 7 years time with excessive suds **finally** damaged the triacs. My LG washer, WM0532HW (ser 4738er1002a) came up with the CE code today. With 4 kids it’s critical that it works full time. I’m going home to crack it open and see if I can determine whether or not the PWB Assembly looks fried. Any direction on where to find that thing? That awwta git it fer ya!